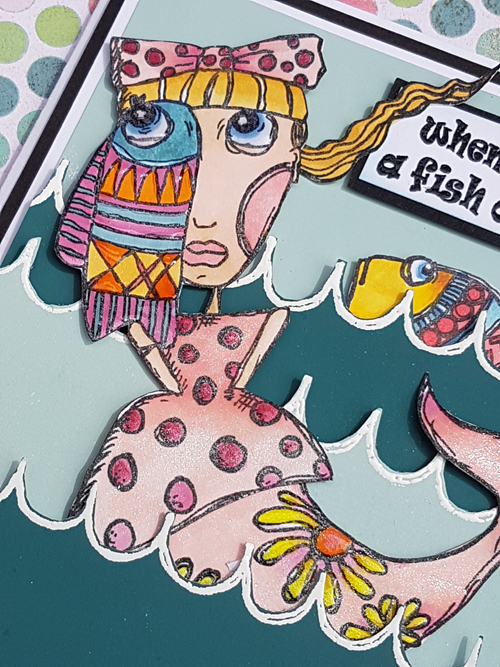 We know you love a bit of Zinski Art fun, and again, we are thrilled to have Elena design some outstanding fishy creatures for your summer-stamping pleasure! 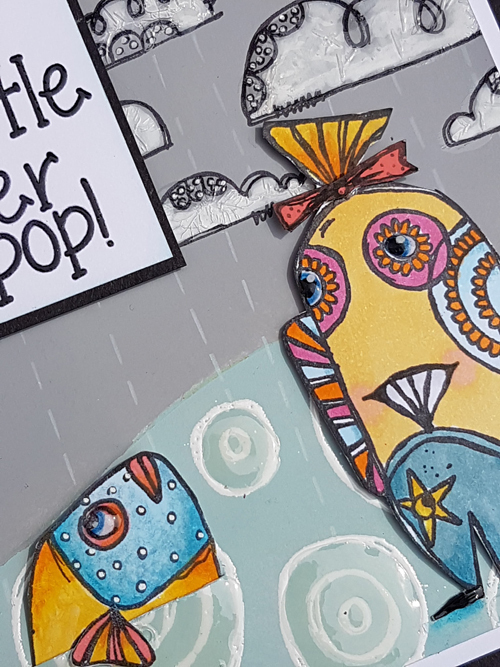 Her trusty sidekick Lauren has turned out some fabulous samples in her inimitable way, making sure that you use every stamp in not quite the way you might first imagine!! 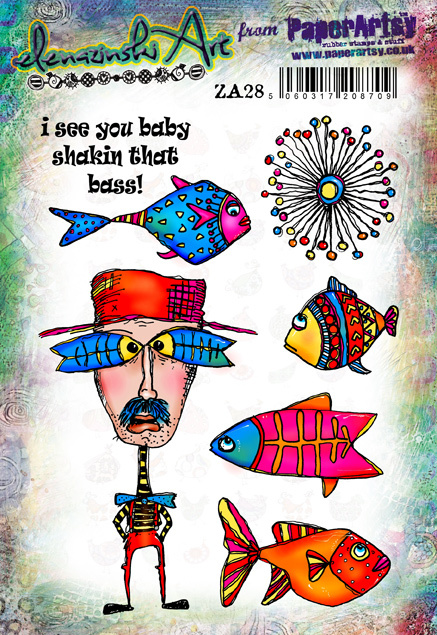 I've had these little fish waiting in the background for a while and thought it was time they came out to play. 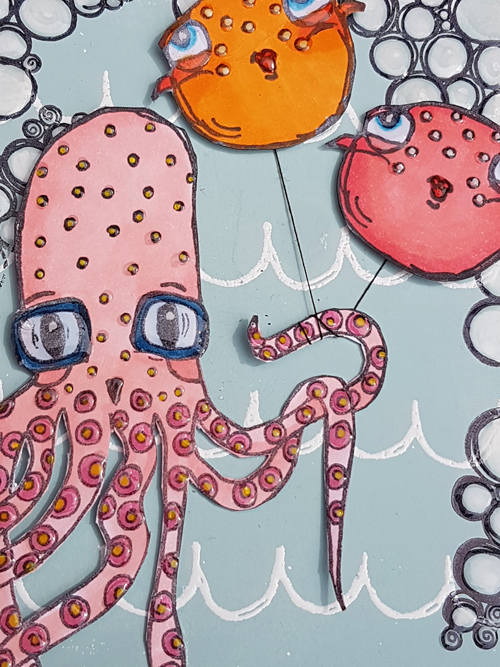 Lauren makes the most incredible projects with everything she touches, I can see these little guys being used for so many things, birthday cards, art journal pages, wall art and i think they'd be fabulous on fabric or to make patterned papers. 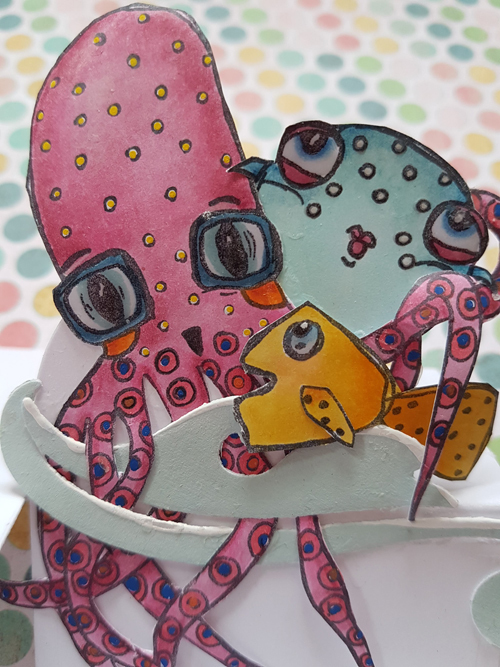 I can't wait to show you my new stamps, there's an art sample for each new product too. 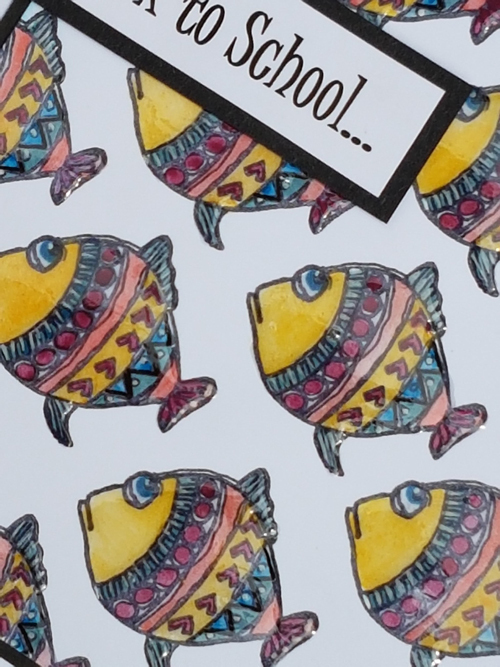 Leandra says: Elena's stamps are always super fun, and it's time for FISH! 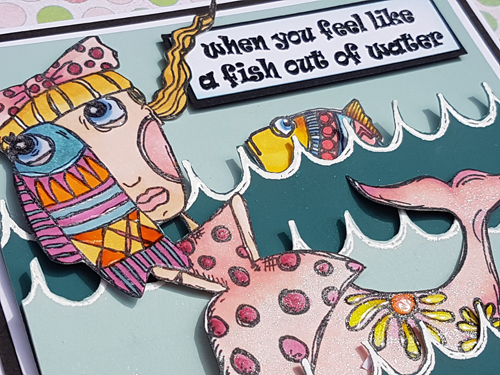 Every day for weeks Lauren has been coming onto work revealing snippets of the weird and wonderful things she has been creating with these new stamps! You are in for a treat! 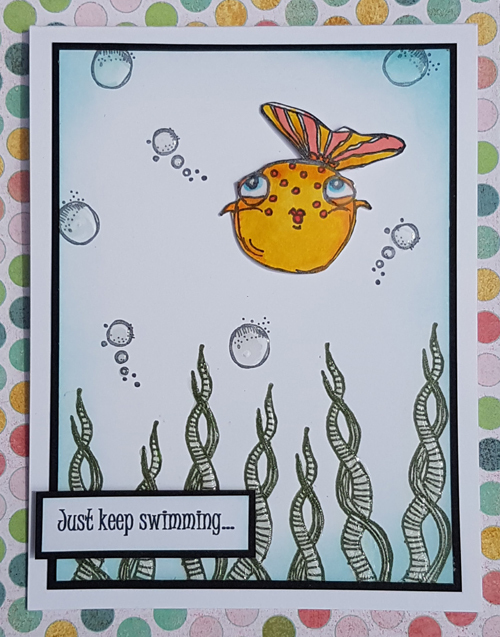 I LOVE this little fish. The expression on his face is priceless. 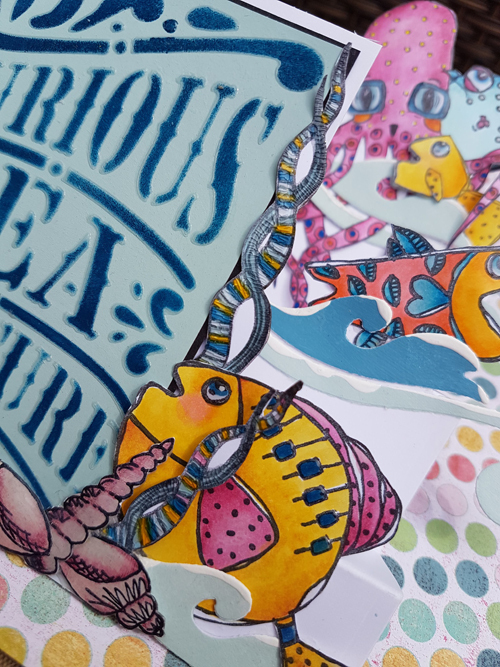 A bit of quiet time well spent... A dash of colour and a bottle of Glossy Accents was all I needed. 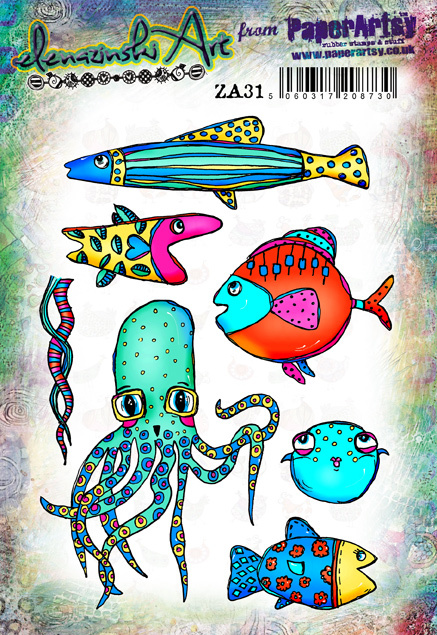 Wouldn't this pattern be great on a mug, plate or fabric....! This is my favourite kind of project. 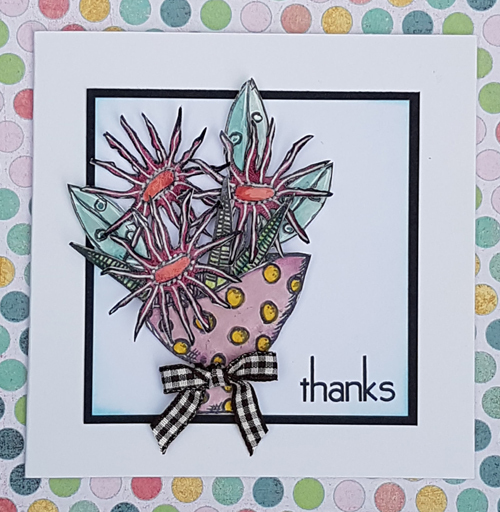 I love to really get the most out of my stamps and bring in elements from other designers to add my own personal touches and make a project stand out. 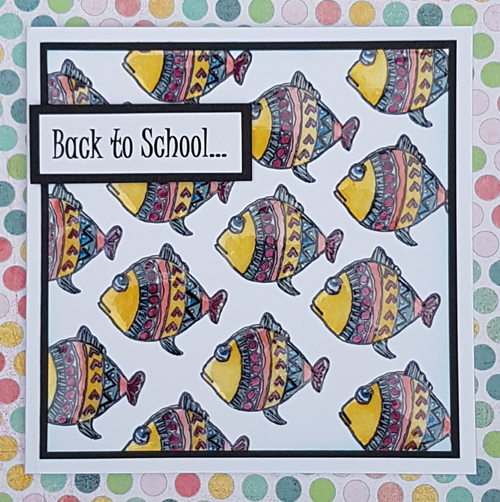 I had to have a fish popping out of one of the puddles, which I made with a stamp from EKD01. A little bit of decapitation at work here. 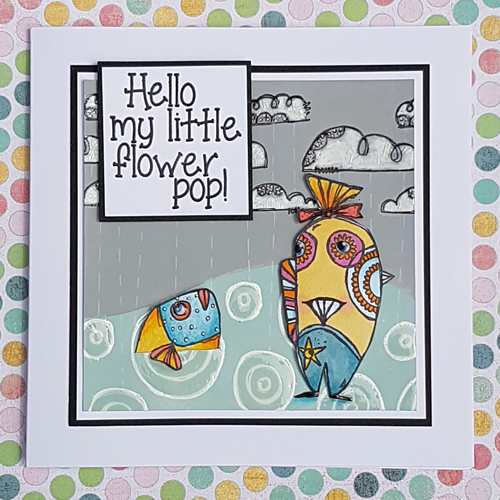 I couldn't resist cutting the dress and legs off our little fish girl to make this bouquet of flowers. . 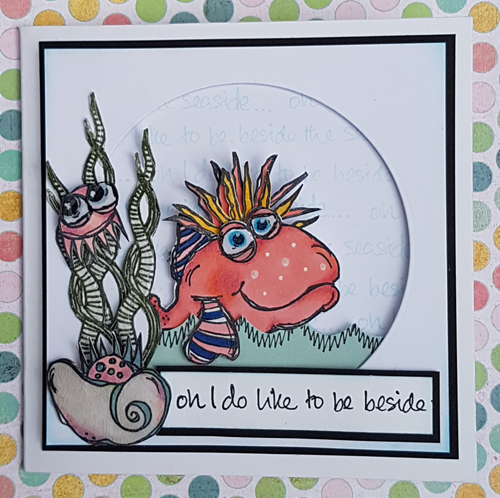 I've used some leaves from a previous stamp release and the little Sea Creature from ZA30 below. 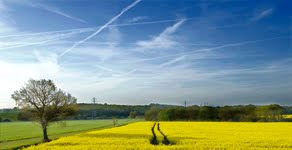 The stripey legs looked like tropical leaves when you cut the feet off and colour them green. 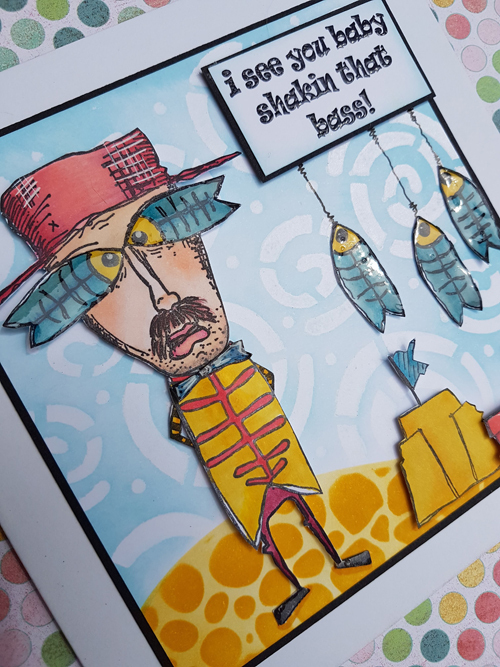 I love this little fish and decided he needed hair. (Leandra has named him Boris, which I think is hilarious!). I was really pleased that I got to make a sea shell from one of the flowers in .ZA09. It's perfect! 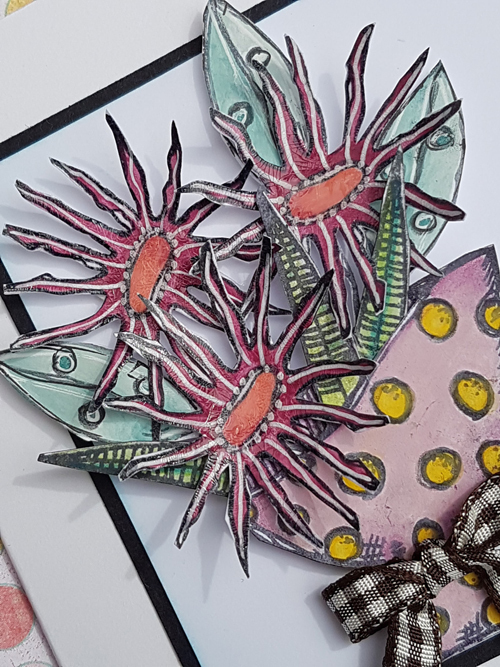 It's great when you can pull together elements from stamps already in your collection so I always have a quick rummage to see what works. The waves are actually a border from a JoFY Christmas Stamp. Who'd a thought it eh? 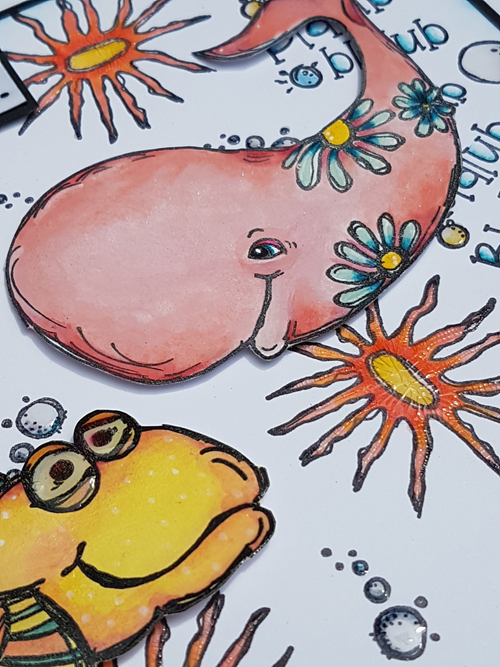 This pair look like they're up to mischief... As ever, the expressions really add character to Elena's amazing creatures! 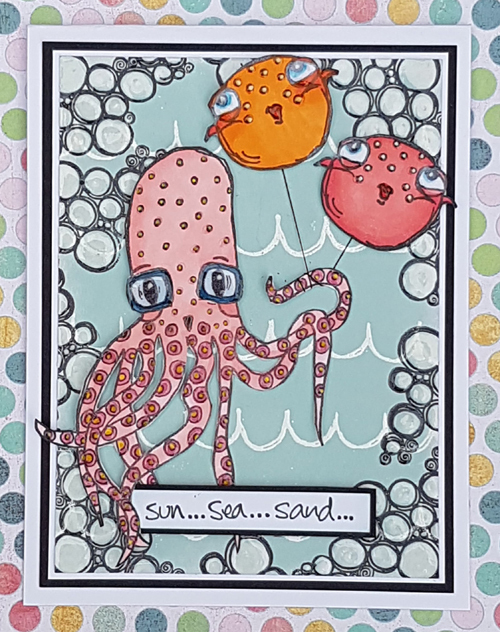 The bubbles from ZA03 came in very handy for these seaside themed cards whether you use them as air bubbles or speech bubbles. I know what you're thinking...but he's actually not too difficult to cut out... Honest! 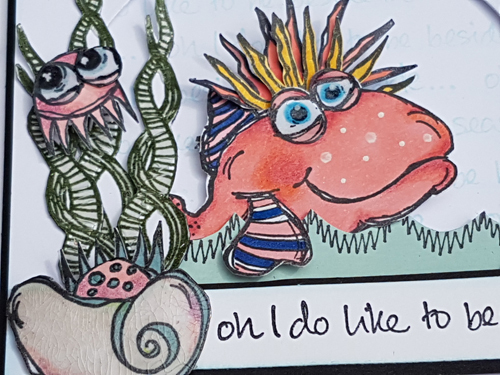 I never waste any of my off-cuts if I can help it; so when I had a spare puffer fish and the tail from the fish in the puddle I realised I could make him into a little goldfish.... Easy Peasy...! 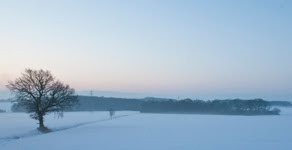 I used Sea Glass with it's partner, Pine Grove for the sea. 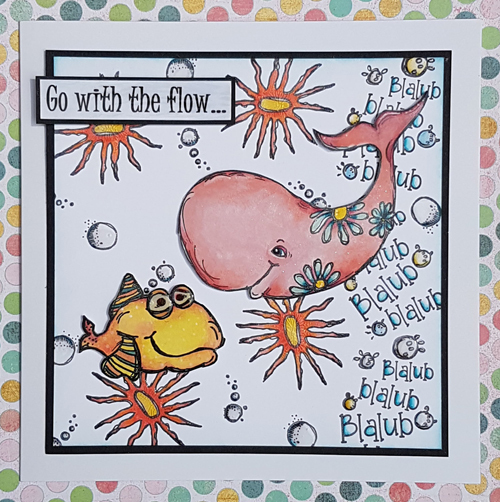 I stamped the waves in white using the scalloped border from JoFY18. 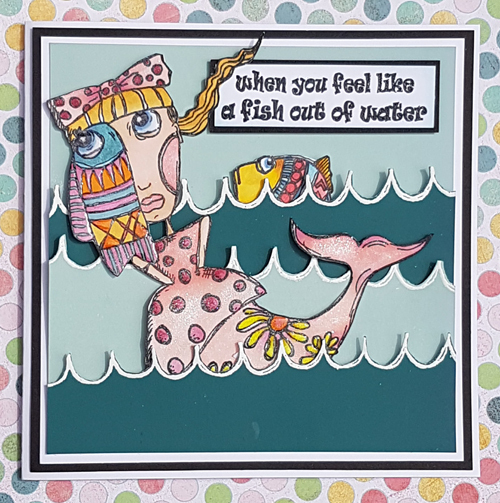 I layered each alternate layer at a slight angle with foam tape, which left me room to tuck in Miss Merminski and her fishy friend before adding the all important sentiment. 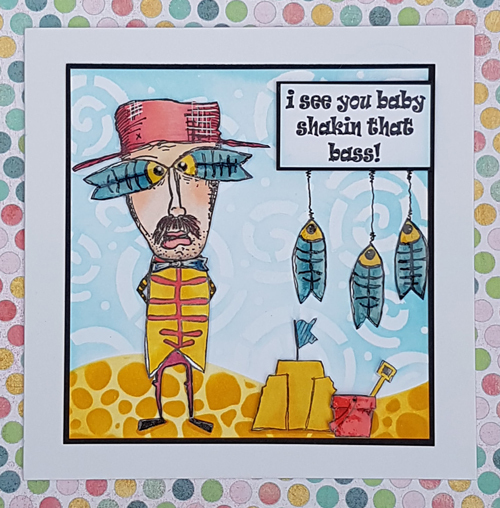 I couldn't resist making another stepper card. 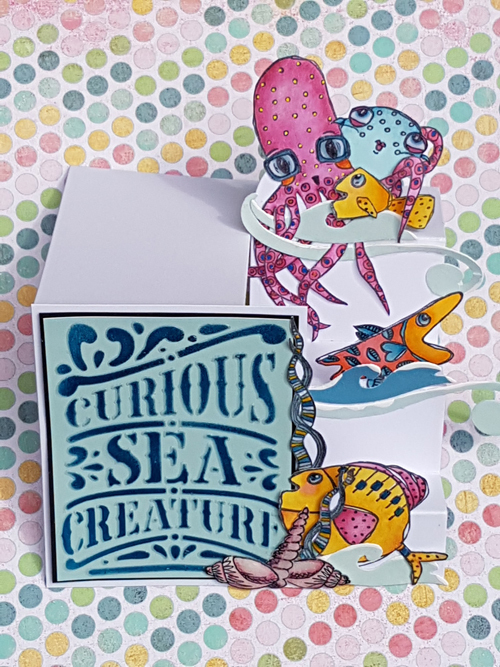 I thought Scrapcosy's Curious Sea Creatures stencil, PA93, was a great place to start. 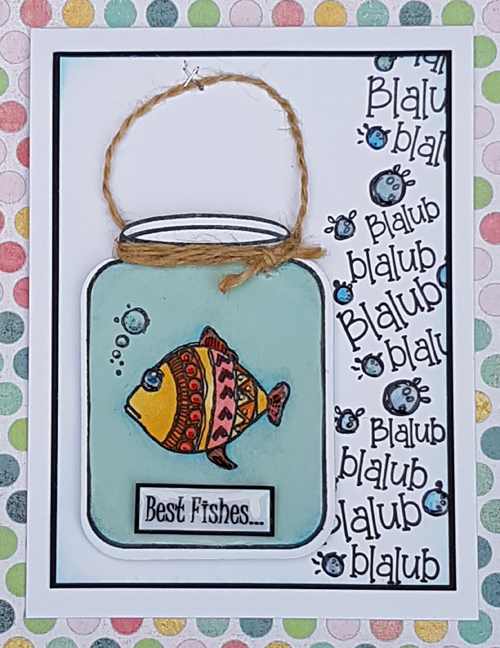 I stencilled onto a Sea Glass background with Surf's Up and then put some 3D Gloss Gel through the stencil to create a sort of glass bottle effect. 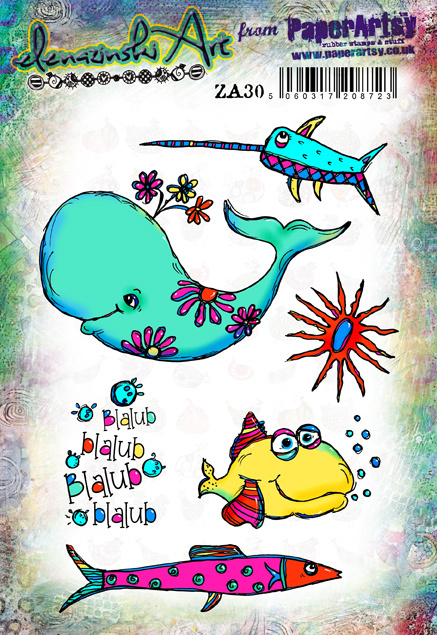 Thank you for sharing our under the sea day, have lots of fun! Congratulations on the new release. They are fabulous. And wow...amazing inspiration from Elena and Lauren. Congrats on the new release Elana ! 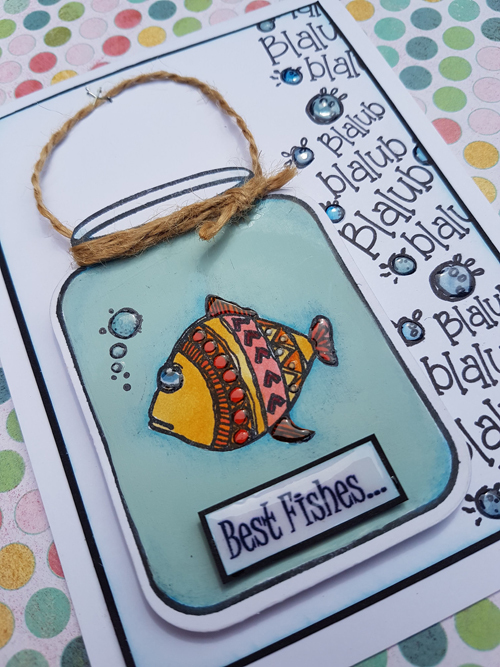 Great stamps and samples too ! 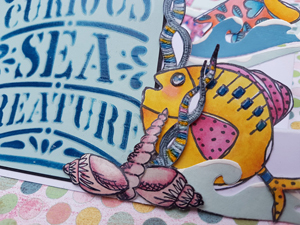 Amazing stamps and samples. So imaginative and really made me smile! You’re amazing Elena! These stamps are superb!! 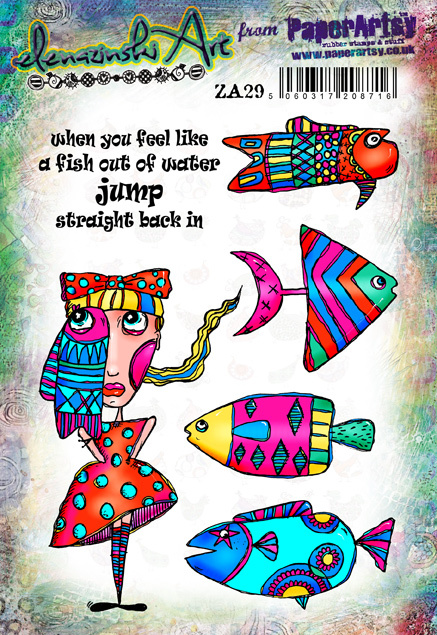 Let’s play FISH! !